India’s biggest philanthropic festival is here! Daan Utsav, also known as Joy of Giving, is a week-long event where many individuals step forward to help the needy by ‘Acts of Giving’ . It was launched in 2009, and is celebrated every year – commencing on Gandhi Jayanti – from October 2 to 8. From auto rickshaw drivers to CEOs, school children to celebrities, homemakers to opinion leaders and media personnel, millions of people from all walks of life come together during this week to give their time, money, resources, or skills back to society. Whether it’s caring for the environment, animals or underprivileged kids and women or supporting other causes that are close to your heart. It’s an opportunity to experience happiness! #DaanUtsav teaches us two lessons in life; “one is incredibly lucky to lead a very privileged life and second is that it would be extremely selfish not to think about the less fortunate around us as we go forward in life. Wrap a box of kindness and help an old man smile. Share a piece of love and let a child jump with joy. We believe change begins with you. The Joy of Giving week is a platform for all of us to contribute to a cause and to make a difference in society! Let’s pledge to step out, find opportunities to give to a cause and return with lasting pride. Happiness is, after all, an act of giving. 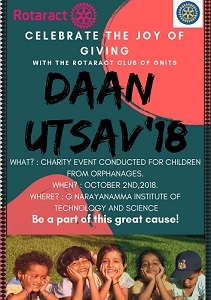 As a part of Daan Utsav celebrations throughout the country, We, at Rotaract Club of GNITS, RID 3150 are organising a day out with kids of various orphanages across the city. Fun-filled group activities that would enhance their skills as a team player. Educational Documentary screening; to motivate them in life. Various events to explore their skills and talent. We cordially invite everyone to be a part of this event and experience happiness like never before through the art of giving! Let us share a piece of love and let a child jump with joy. We believe change begins with you. The Joy of Giving week is a platform for all of us to contribute towards the change and to make a difference in the society! Let’s pledge to step out and find opportunities to support a cause, so we return with lasting pride. Happiness is, after all, an act of giving.